YES! Send me my FREE issue of St. Anthony Messenger, and sign me up for a one year (12 issues) subscription for a total of 13 issues. 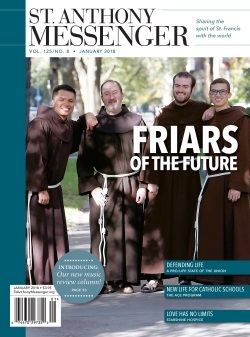 The digital-only edition of St. Anthony Messenger can be read anytime, anywhere. Enjoy entire issues plus digital extras-video, audio and interactive content- that bring articles to life. I understand that I will be auto-renewed for the same subscription term I'm ordering today.